Art by street artists Icy and Sot. Responsive regulation is about ‘tripartism’ in regulation. It highlights the limits of regulation as a transaction between the state and business. It argues that unless there is some third party (or a number of them) in the regulatory game, regulation will be captured and corrupted by money power. 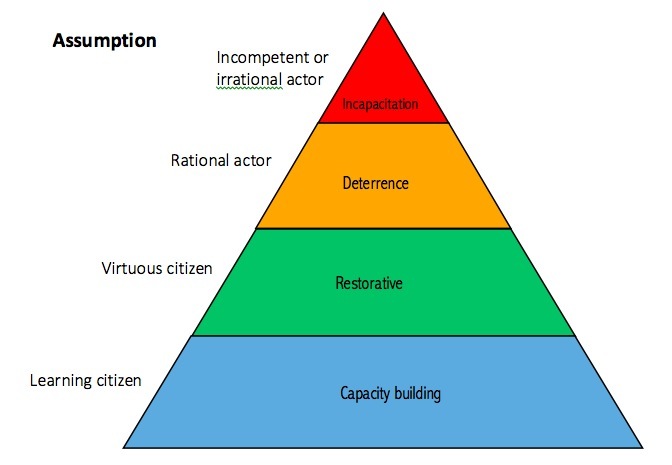 Responsive regulation involves listening to multiple stakeholders and making a deliberative and flexible (responsive) choice from regulatory strategies that can be conceptually arranged in a pyramid. At the bottom of the pyramid are more frequently used strategies of first choice that are less coercive, less interventionist, and cheaper. 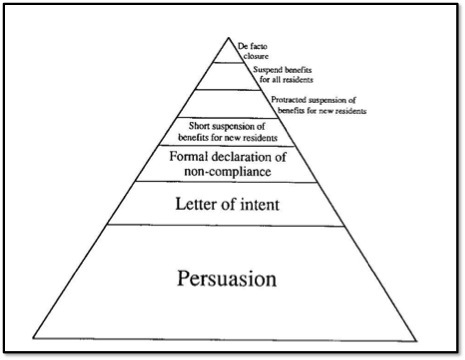 Australian nursing home regulation pyramid from the 1980s. Australian Office of Transport Safety Responsive Regulatory Philosophy. Note: TSPs are Transport Safety Plans. 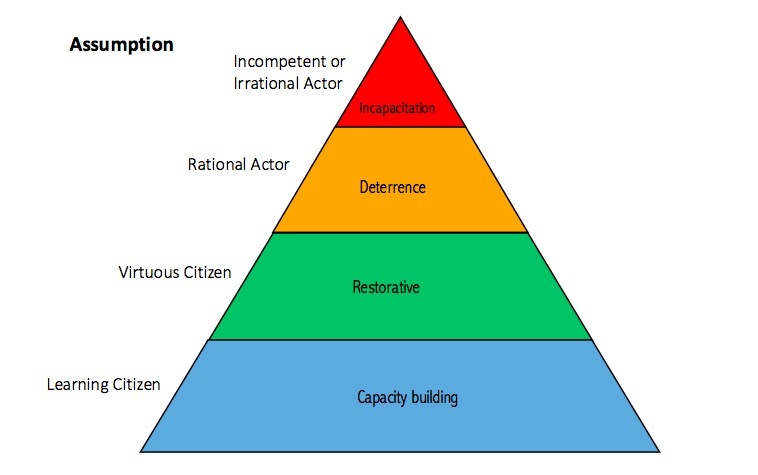 The essence of responsive regulation describes why the flexible listening components of responsive regulation are more fundamental than the pyramid. 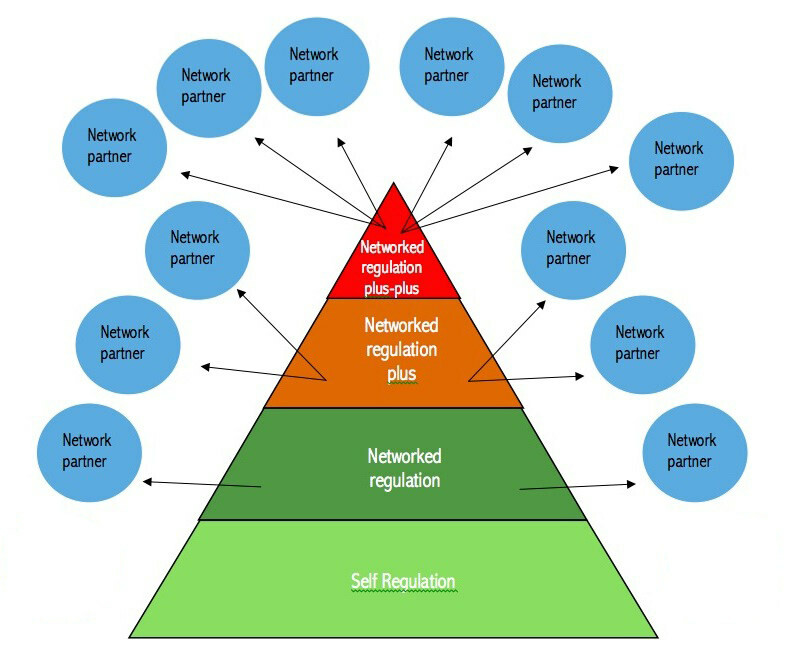 Because poor countries struggle to escalate state regulation against powerful corporations, the next move was then to a pyramid of networked escalation. 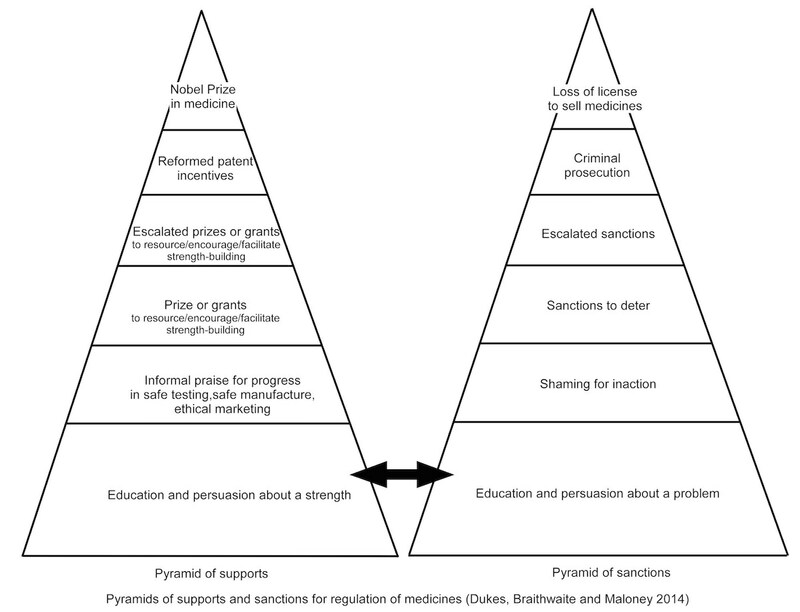 Peter Drahos’s influence on the development of this pyramid is discussed in J. Braithwaite (2006) “Responsive Regulation and Developing Economies“. Schell-Busey, Natalie, Sally S. Simpson, Melissa Rorie, and Mariel Alper. 2016. ‘What works? A systematic review of corporate crime deterrence’. Criminology & Public Policy 15(2) (available here). John Braithwaite, 2016. In Search of Donald Campbell: Mix and Multimethods. Criminology & Public Policy 15(2) (available here). Mary Ivec and Valerie Braithwaite with Charlotte Wood and Jenny Job. 2015. Applications of Responsive Regulatory Theory in Australia and Overseas: Update. RegNet Occasional Paper 23, School of Regulation and Global Governance. And more than 100 working papers, many based on qualitative evaluations, on Valerie Braithwaite’s Centre for Tax System Integrity website. Video: Radical Ideas in Justice and Regulation, J. Braithwaite, Ronin Films, 2014. 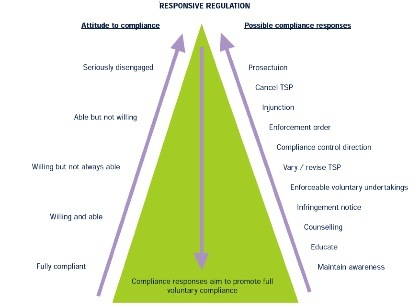 You can also watch a video explaining some of the key ideas in responsive regulation, below. The following publications developed the ideas of responsive regulation in the early years. Only after Ian Ayres joined us was ‘responsive regulation’ used to describe this work. J. Braithwaite, “Enforced Self-Regulation: A New Strategy for Corporate Crime Control”, Michigan Law Review, 80, 1982, 1466-1507. J. Braithwaite (1985) To Punish or Persuade: Enforcement of Coal Mine Safety. Albany, State University of New York Press. J. Braithwaite and P. Grabosky (1985) Occupational Health and Safety Enforcement in Australia. Canberra, Australian Institute of Criminology, 1985. P. Grabosky and J. Braithwaite, Of Manners Gentle: Enforcement Strategies of Australian Business Regulatory Agencies, Melbourne, Oxford University Press, 1986. J. Braithwaite, T. Makkai and V. Braithwaite, Regulating Aged Care: Ritualism and the New Pyramid, Cheltenham, Edward Elgar, 2007. J. Braithwaite, Regulatory Capitalism: How it Works, Ideas for Making it Work Better, Cheltenham, Edward Elgar, 2008. J. Braithwaite, Markets in Vice, Markets in Virtue, Sydney and New York, Federation Press and Oxford University Press, 2005. This website hosts John Braithwaite’s research and blog on war, crime and regulation. John Braithwaite leads the ‘Peacebuilding Compared’ project and is the founder of the School of Regulation and Global Governance (RegNet) at the Australian National University. Please note that John’s old website at ANU is no longer being updated and hasn’t been done so for over 2 years. Website developed by Kim Suree Williamson. Content edited and managed by Camille McMahon. Copyright 2016 John Braithwaite | All rights reserved.